I have an idea for an ice cream that I'm going to keep to myself for now. But I'll let on this much: it will contain spices. En route to that creation, I was going to make an ice cream with just one spice, e.g., cinnamon or cardamom, but I happened upon a recipe in Bruce Weinstein's misleadingly titled The Ultimate Ice Cream Book for oatmeal ice cream made with cinnamon, and it reminded me of the Ben & Jerry's flavor oatmeal cookie chunk, which you can drool over here. I didn't follow Weinstein's recipe (p. 89) to the letter (I almost never follow any recipe to the letter, as you might have gathered). I did use almost the same ingredients as he calls for, though: sugar, egg yolks, half and half (he calls for milk), rolled oats (not the quick cooking kind), salt, cinnamon, and cream. I added raisins, which he suggests in a variation. In my web searches on the topic, I also unearthed this recipe from the oat millers of Ireland: an ice cream made with pinhead (you might call them steel cut) oats that are toasted but not cooked in liquid, and frozen in ramekins rather than in an ice cream machine. I leave it to Haverchuk's readers to have a go at that one. Please let me know how it turns out. I began by making oatmeal with half and half instead of the more customary water or milk. I also added cinnamon and salt. One of these days I will make a really salty ice cream (on purpose!) but for now the salt was just to wake up the oatmeal flavor. According to my sources, salt functions to call the tastebuds to attention, making every ingredient taste more like itself. Chocolate with a bit of salt tastes more, well, chocolatey. 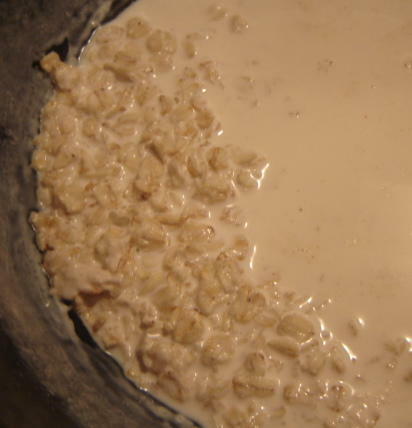 I proceeded with the custard creation using this oatmeal mixture as the cream: oatmeal mixture, additional heavy cream, eggs, sugar, 170 degrees. I chilled it overnight in the fridge. When I looked at my mixture this morning it was noticeably thicker and more luscious than my usual ice cream base. This gave me immense pleasure. I froze it and it became solid very quickly, perhaps in half the time of the usual ice cream. More pleasure. I stuck a chopstick into the machine as it was running, careful not to strike the revolving paddle, and licked it clean. Pleasure, pleasure, pleasure. I then dumped it into a plastic container and folded in a few handfuls of raisins from Trader Joe's amazing raisin medley. Now the eating. 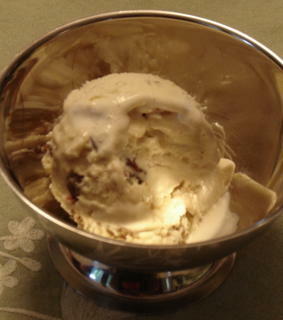 The flavor of the ice cream is excellent: it tastes like a splendid bowl of oatmeal, only cold instead of hot. But the revelation was in its texture. This was the most silken, luxurious-textured frozen dessert I have made. It's really different from the basic custards, which were good but not this good. (This should be evident from the paddle photo above if not from the scoop shot below.) I assume that it is the starch that creates this effect. So let us now praise starch. Starch: we love you. You're the best. Good riddance, Atkins cult! On the negative side, I put too many raisins in. I wanted one per bite. Some bites had two. Next time will be perfect. Jeebus, that sounds amazing. I have finally tried the aforementioned B&J's flavor a few days ago, and it was quite luscious. How did yours compare to B&J's? I'm imagining yours was richer but not as sweet (a good thing!). I love your ice cream project and will be reading it with some interest, as I do my own contrasting experiment with lower-fat frozen delights (no, I will not call them ice cream because they are not, but they are still cold, sweet, and tasty). Thanks so much, Miss T. My ice cream was different from B&J's and I prefer mine, but I don't really know if one is better. I don't usually like ice creams that have big chunks of stuff in them (like cookies or cookie dough). I look forward to seeing your lower-fat frozen delights. 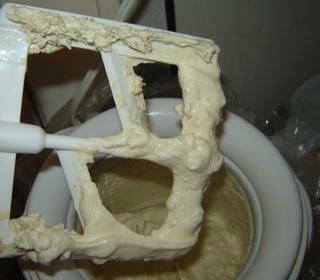 I'm actually chilling a lowfat version of this oatmeal ice cream tonight for churning tomorrow. At this present time all of my frozen things are a little more grainy than they need to be because I am beating by hand in a bowl - no ice cream machine. I don't remember the exact measurements but I would guess it was around 1 cup of oatmeal, a quart of dairy (3 cups h&h and 1 of cream), 8 yolks, 9 oz of sugar, half a tsp of salt, and a tsp of cinnamon. I will look again at Weinstein's recipe, which almost certainly has the oatmeal and cinnamon quantities I followed. Fantastic...that's probably enough to give it a go, but I'll check back to see what Weinstein had to say, or see if I can find the book locally. Thanks! "Perhaps we're just that kind of creature"